Tara was home. A sprawling dwelling made of stone on a busy city street. This quaint wada had been built around 100 years ago. A small but beautiful garden welcomed you once you entered the gate and at the end of a meandering cobbled path was the main entrance of the place. As she walked in, the city noise magically vanished. It was a special day today and all her family members had descended on this place, but nobody was in a chatty mood. They acknowledged one another, but all were busy having a dialogue with the wada. Even the ever querulous aunt was uncannily quiet. 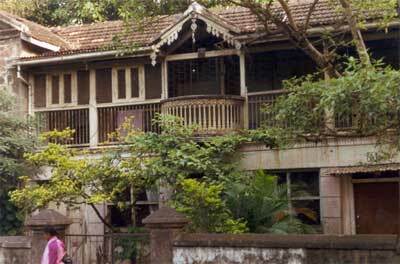 Four generations, of the family, had lived in this wada together. Tara smiled as memories of the many pranks played by her and her boisterous cousins played back in her head. This wada had been her sanctuary, a place to run away to from the pressures of modern living. The quaint surroundings filled her heart with peace. She had learnt, lived, loved and even wept here in its embrace. She saw everyone was lost in their thoughts. Everyone had many stories that just flowed out from the recesses of their memories. Now, as is the rule of nature, the old had to make way for the new and the wada was being torn down to make way for modern apartments. Today was a get-together where they all came and bid goodbye to their beloved wada before it became history. *Disclaimer- The image is just used for representative purpose. The story is not about this wada and is a work of fiction. Linking this story with A-ZChallenge and Blogchatter. Such a shame that beautiful place could be converted into appartmenrs without it being torn down. Sad. In future, they will build solitary places to live, away from apartment cities. The fate of many run-down buildings full of rich history. Tragic and yet we cannot stop time. Life does move on. Memories are what we have to hold onto. Sometimes we just need to acknowledge that and let go, especially of places. This reminded me of my grandma’s old house which they sold off before moving to the city. Celebrating ‘Women & their work’ all April @NamySaysSo Queen of Tennis, Serena Williams, wins grand slam while pregnant! That is so sad….Felt the same when our ancestral home in the village was torn down to give way to a modern house. Blessed is the family who had such a place that was home to generations, where they could gather and share events and memories. It is sad that old homes are so often torn down to be replaced with unfeeling boxes that will never have that same connection to those who live there. I can empathize as my parents left the home I grew up in a few years after I was married, and the places they lived after that never really felt like home, I felt like a visitor. For my children I am sure it is the same, as we have had to move many times in the years they were growing up, and they have never lived in the home where I reside with Papa Bear now. What a beautiful quaint (the rightful word to be used 🙂 ) to have lived in! No wonder, one might get sad on its destruction. But old have to move on to give way to the newer ones. Thats how life is. Thanks for sharing this short little fact of life by means of fiction. Enjoyed reading! Hi Neha. Thank you for visiting my blog. I’m glad you did and now I’ve found my way to you:) Poignant story telling that touches a sad reality of so many beautiful places in India. “She had learnt, lived, loved and even wept here in its embrace.” love this sentence. I love these Wadas, but sadly they are not around anymore. Modern construction has erased them from memory. Loved the story you built around it, Neha.